Going vegan would be a challenging commitment for many meat lovers. But if Queen Bey commands it, anything is possible. At least that's the sentiment Beyoncé's fans are expressing after the superstar singer announced that new vegans may have the chance to win free concert tickets ... with a catch. 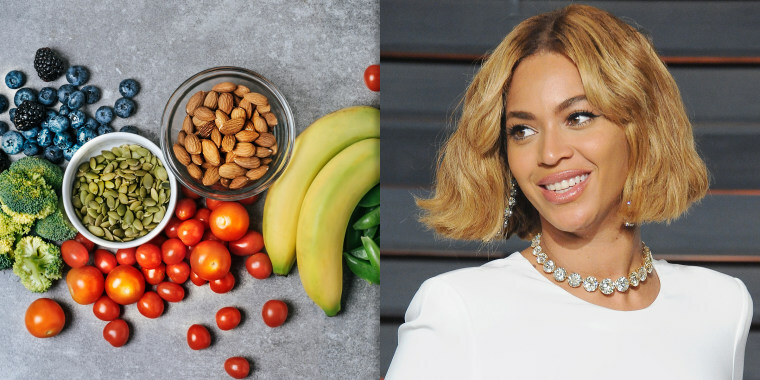 Last week, Beyoncé asked her social media followers to check out her new project, The Greenprint Project (which she promotes with hubby Jay-Z and their nutrition coach Marco Borges), that encourages people to eat more plant-based foods for a healthier life, body and planet. The incentive to sign up? A lifetime supply of free Beyonce and Jay-Z concert tickets. Most of the couple's fans thought that they actually had to go vegan — completely vegan — to score the prize of all prizes. That would mean no delicious wintry meat stews, no bacon-laden McDonald's dishes and no eggs. The frenzy over the possibility of being able to attend endless Beyoncé concerts (with tickets that often go well into the high three figures) brought forth a slew of hilarious memes, with devoted fans pledging to pretty much do anything their queen desired. Needless to say, Beyoncé got them lookin' so crazy right now. or that they would even overcome their former president George H.W. Bush-like disdain for broccoli. Others said they would persevere through meat withdrawals. However, for all the people who accepted the "challenge" reluctantly, Beyoncé's Greenprint Project promo is not really a challenge to go fully vegan at all. The official rules of the contest state that fans simply need to submit their full name and email address on the website to enter. That's it, y'all. Once people have the chance to poke around the website, however, Beyoncé and Jay-Z are hoping their fans will better understand what their mission is all about. For example, one page says that simply eating one plant-based meal can save 27 pitchers of water. Maybe the celebrity couple will be able to convince a few folks to swap out steak on "meatless Mondays" or opt for a healthy bowl of oatmeal instead of a bacon, egg and cheese breakfast sandwich. Or maybe they will actually try going vegan. While Beyoncé and Jay-Z aren't vegans year-round, they often try vegetarian or vegan meal plans for an extended period of time.